Soft, light, and cozy, guaranteed, these scarves feature passages from two beloved books. 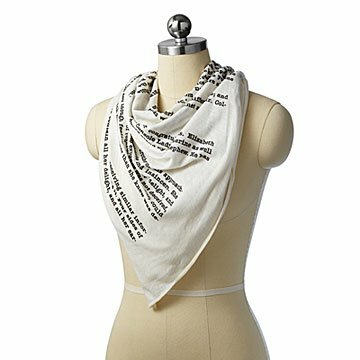 Decorated with passages from two beloved books, Pride and Prejudice and Alice in Wonderland, maker Tori Tissel's soft, lightweight scarves can be worn any way that suits your style. Itching to go down the rabbit hole yourself, or perhaps relive Mr. Darcy's declaration of love? Either way, these square-shaped beauties—each equipped with a hem that keeps fabric from fraying—will ensure you do so in style. Just twist, turn, and knot the buttery cloth to your heart's content and you'll be looking fine (and well-read) in a flash. Handmade in Oregon. It's creative, beautiful, functional and can also be a great conversation piece.